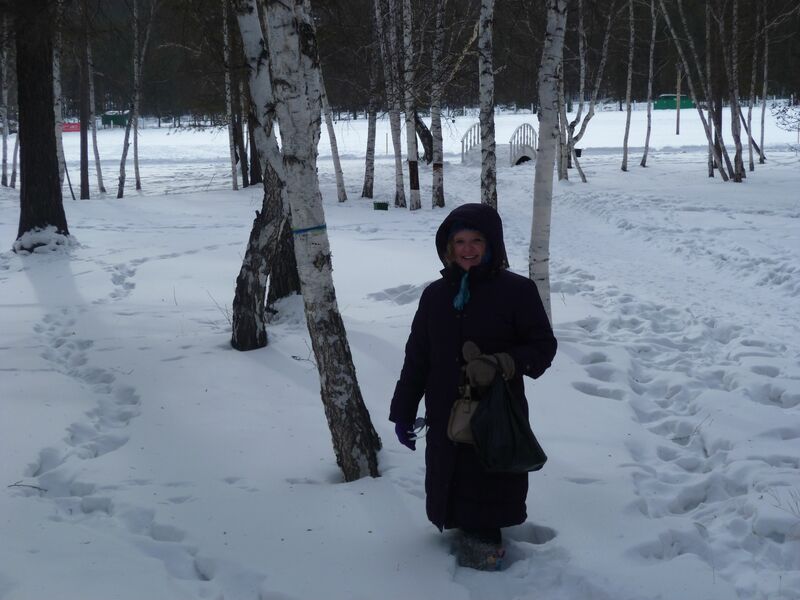 My first day in Ulan Ude was fairly uneventful. I had only two goals: go see the big Lenin head and mail some postcards. I’m staying with this sparkling woman named Olga and her sister, Tatiana. 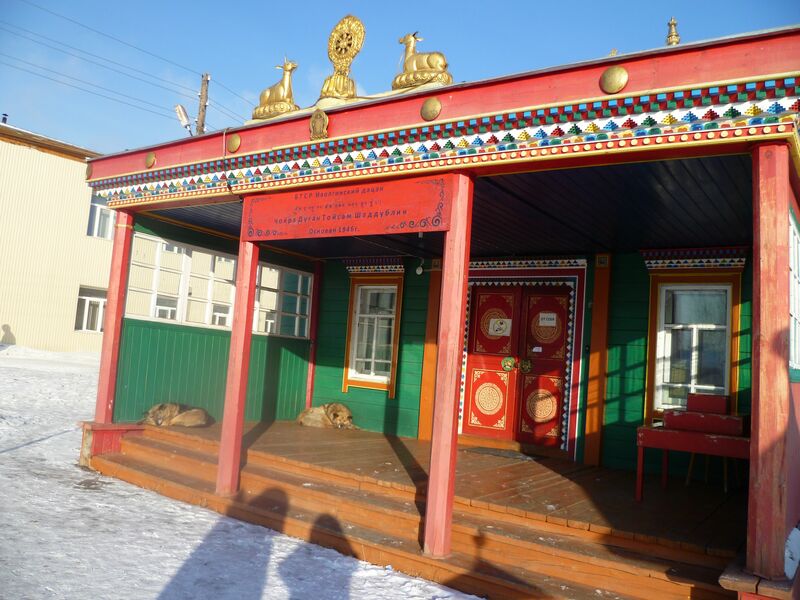 They are from a prominent Buryat family and therefore inherited a huge and antique-packed apartment right in the center of town. 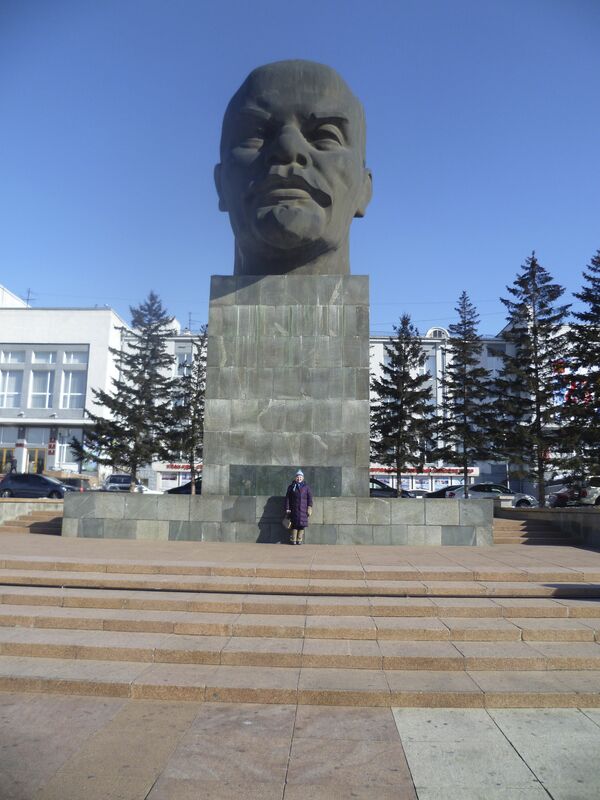 It was super easy to find the Lenin head, but getting there was another matter entirely. Drivers in Ulan Ude are INSANE. As Tatiana pointed out to me later, “Oh, well, driving in the United States is probably easier because you only drive on one side of the road.” Here, cars are speeding every which way down streets with no traffic lights. I tried to time my street-crossings to coincide with that of other people, but I swear it seemed like some cars were trying to mow us down on purpose. So, as promised, here’s me and Lenin’s head. After a frightening and fruitless search for postcards, I dodged a broken water line to get inside the post office, where a worker insisted to me that they didn’t have any postcards even though I could see them right behind her. So I tried a different tack, “Ok, you don’t have any postcards, but maybe some cards with pictures on them, like maybe those?” Finally I convinced her to sell them to me (another struggle) and then I sat down to write them. But it was nearly impossible: the postcards were made of some kind of shiny laminate on which fully functional pens refused to write. So I basically carved letters into the cards with my pens and hurried to the nearest bar for frustration relief. …which turned out to be a sushi bar tucked into the back room of a Subway sandwich shop. One beer later, I returned to Olga’s just in time to have her stuff me with delicious meat pies and hot tea. 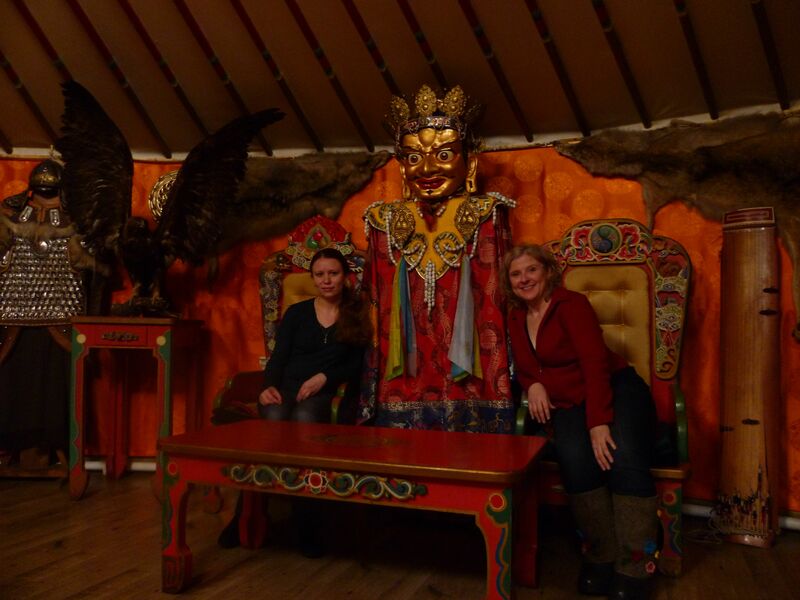 A tour guide arrived at 9am the next morning to take me to the Ivolginsky Datsan, the seat of Buryat Buddhism. Buryats are indigenous Mongols who got swallowed up by the Russian Empire. They practice a type of Buddhism that is sometimes called Lamaism or Tibetan Buddhism. There are so many different kinds of Buddhism that I don’t know all the details, but the Dalai Lama himself is their cherished guru. 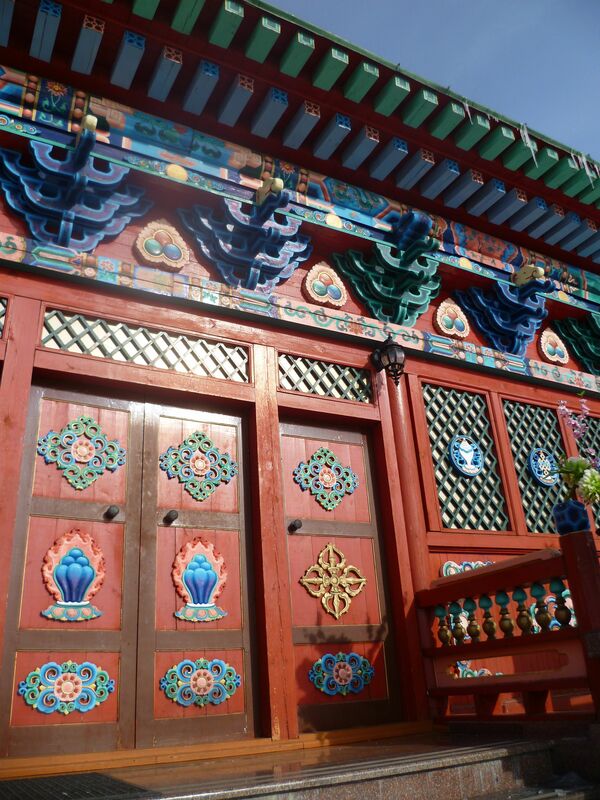 The Datsan is a complex of buildings that includes temples, a university, and housing for teachers and students. It’s an unusual mix of cultures and time periods. 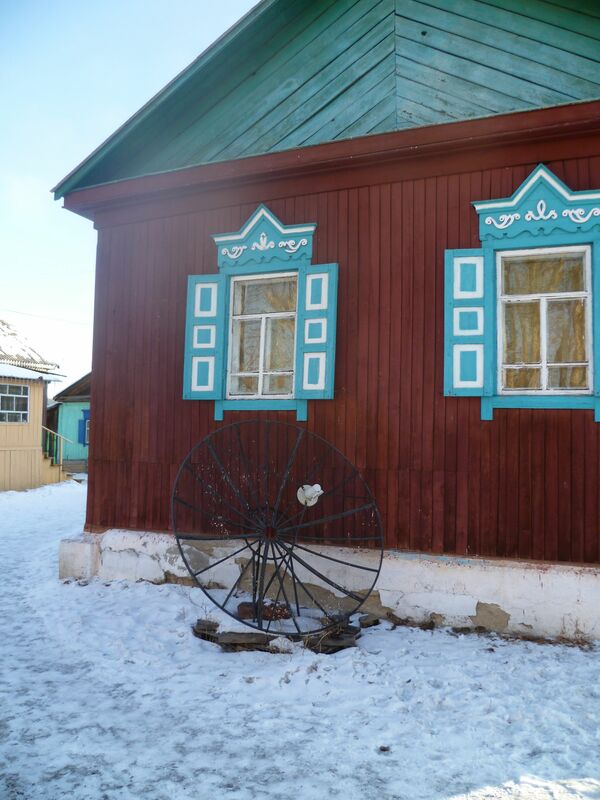 For example, this is a wooden house for students built in Russian style but painted with traditional Lamaist colors. And a satellite dish. 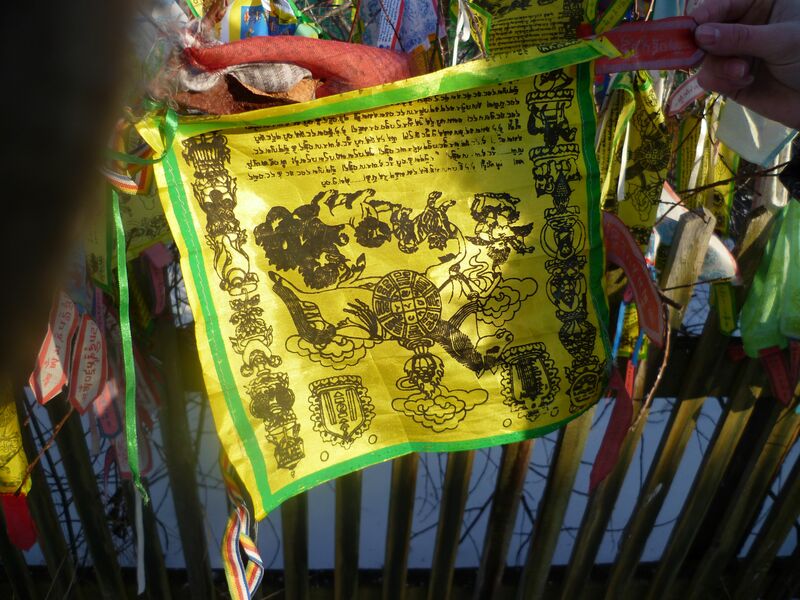 Buryat Buddhists dye and paint prayer flags, inscribed with Tibetan, Sanskrit, and Old Mongolian texts. In the afternoon we wandered through an outdoor museum/zoo, with dashes of archeology here and there, some camels, and a model Western Buryat village. There was a lot of snow at the outdoor museum. Olga has been having me teach her how to use the Internet, so I rushed home to see if she had received any e-mail from her friend in the Netherlands. Unfortunately, she had not. The first night we wrote an e-mail she was so excited– she breathlessly dictated a message for me to send to her friend and asked me to come back an hour later and help her check for a response. But here it is over 24 hours later and there’s still nothing. She’s clearly disappointed but I don’t want her to become completely disillusioned– she has so many friends all over the world that want to communicate with her. She’s been hosting guests since 1985! So many intresting posts, Mom and I get up early to see if we have another one. Thank’s so much for doing them. The shingelaro’s worked nearly 14 hours yesterday on our new roof and were here before 6am today.